We’ll be celebrating the Irish at the end of this week with parades, green beer and green rivers. 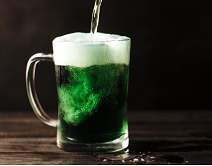 Although only about 10.5 percent of Americans truly have Irish heritage, far more than that will claim a drop of Irish blood on St. Patrick’s Day, and people who forget (or refuse) to wear green will be chided (or “affectionately” pinched, according to a Wikipedia article). But it wasn’t that long ago in our history that most Americans hated and feared the Irish. They also despised the Chinese, Japanese, Italians, Poles, Greeks and Russians. As I’ve read the newspaper for the past year, I’ve been struck time and again by how much today’s anti-immigrant sentiment is both an echo from the past and in direct opposition to what the Bible teaches about how to treat the foreigner or “alien” in our land. This is an issue close to my heart because I am the granddaughter of immigrants. My paternal grandfather came to America from a small town in southern Italy; my paternal grandmother came from Germany. 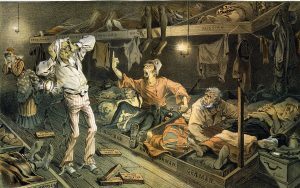 The refugees seeking haven in America were poor and disease-ridden. They threatened to take jobs away from Americans and strain welfare budgets. They practiced an alien religion and pledged allegiance to a foreign leader. They were bringing with them crime. They were accused of being rapists. And, worst of all, these undesirable were Irish. These acts of violence and hate are not isolated incidents. They were fueled by fears and often ignorance. Both Irish and Italians were considered inferior due to their race (deemed “not white enough,” they were sometimes classified as “colored” by state governments) and religion. As a result, they often faced discrimination. My grandfather, for example, felt that he had to change his name and hide his nationality in order to find meaningful work. And anti-Catholic sentiment was fierce. Good, god-fearing Christians did not think Catholics worshiped the same God; they were sure that Catholics owed all their loyalty to the Pope, therefore they must be opposed to American democracy. And this sentiment continued into the 20th Century: even John F. Kennedy had to blatantly assure Americans that he was first and foremost an American and that he would never put his religious views above his responsibility to the country. We are under attack by Muslims at home and abroad. We should stop all immigration of Muslims to the U.S. until this threat with Islam has been settled. Every Muslim that comes into this country has the potential to be radicalized–and they do their killing to honor their religion and Muhammad. Only if you thoroughly reform your ways and your deeds; if each of you deals justly with your neighbor; if you no longer oppress the alien, the orphan, and the widow; . . . only then will I let you continue to dwell in this place, in the land I gave your ancestors long ago and forever. Jesus continues this perspective in his teachings. In Matthew’s Gospel, when Jesus describes the end times and the separation of the sheep from the goats, he explains that those who welcomed the stranger and cared for the poor will inherit eternal life. 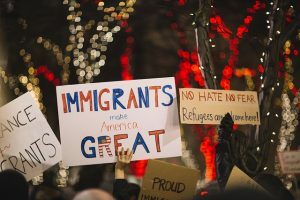 There really is no wiggle room when it comes to interpreting what scripture teaches about how we should respond to the many issues facing our country regarding immigration. Should we allow our immigration laws to separate children and parents? No, that would be oppressing the alien. Should we restrict people on the basis of their religion? No. Should we deport young people who were brought to this country illegally when they were children, forcing them to leave the only home they know to start a new life in a country they had little or no memory of? No. Should we barter the lives of those Dreamers to push through other restrictions on legal immigration? No. Should we bar the door against all refugees from countries wracked by famine, war, and unstable governments? No. We are to care for the poor, to shelter the homeless, to treat all people with dignity. This is not to say that there cannot be some limitations on immigration, or careful vetting of those who wish to enter our country. In fact, we already have this. But you’d never know it from all that has been said about the danger of allowing refugees and extended family members of legal immigrants to enter the country. There is some mighty fear mongering at work in some of the highest levels of our government, and, just as it was in the 19th and 20th centuries, it is based on ignorance and racism, not fact. And, from a Christian perspective, it blatantly ignores Biblical teaching while imagining a world of scarcity. In this world, there is not enough to go around, and caring for the orphan and alien takes away jobs and food from the citizens. A careful investigation of our history, the current realities and the Bible paints a very different picture. We have a responsibility to our neighbors–legal and illegal, already within our borders and those people of the world seeking a better life. And we are to trust in a God of abundance, who can meet our needs if we follow his clear teachings of care and compassion and reject the fear mongering that would have us revisit some of the worst periods in our nation’s history. Once again you’ve hit the nail on the head. Thank you for reminding us that our history isn’t as idealistic and wonderful as some folks want to think it is. I’m not sure why so many think reversing the progress forward in favor of a return to the past is making America “great” again–especially those who profess to be Christian. The Biblical references and interpretation here are spot on. You would think our society would have moved to another level of compassion by now. Thanks for the reminder.